DESCRIPTION: Frog with bright coloured body is called "Poison Dart Frog". Their bright collared skin is because of the level of toxicity and alkaloids. It lives in tropical or subtropical climates. Under the harshest of conditions, the meringue-like structure helps frogs to protect their children. The nests look soft but they have a hard structure. The foam structures protect them from high temperature and sunlight. The unintentional trapping of air bubbles makes it can go underwater to hunt for prey that stayed at the surface. Frog represents biological inspiration for new ideas and innovations. Throughout the history, many designers and scientist are inspired by frog's way of solving problem without barriers to build innovations. For example, cars inspired by frog shapes, lamp inspired by frog's eyes, helmet inspired by frog's head. 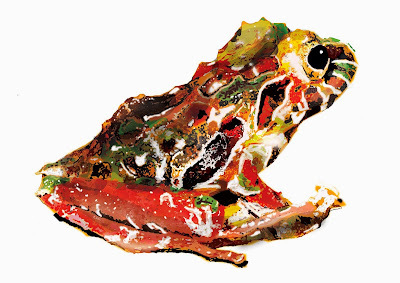 Hope, this bright coloured frog inspire us to invent something.